New year, new blog topic! Last year I posted an interview with Private Investigator extraordinaire, Sid Rubin. Today, I’m kicking off a series of interviews with expert knitters whom I know personally. Why interview knitters? For so many good reasons. First, my protagonist, Maxime Martin, is an expert knitter himself. It’s his therapy, his meditation, the only reliable way he knows to still his overactive mind and calm his frayed nerves. Second, it’s one of my hobbies as well so it’s always exciting to learn from a master. Third, knitters are a largely misunderstood group; knitting is a curiously holistic activity because it engages the body (well, the fingers at least), mind, and spirit. If you don’t quite understand what I mean by that, you will as you read though these posts about why and what expert knitters knit. I’m inaugurating this topic with an interview with my friend Catherine Smegal, who I met a few years ago when she started a French conversation group that I attended from time to time. I soon discovered that there’s much more to Catherine than her love for all things French: she’s a voracious and discerning reader, an extremely talented knitter, a beauty expert, a yoga aficionado, an animal lover, and the kind of caring, thoughtful soul that everyone should be so lucky to include in their circle of friends. Q: Why do you knit? A: Knitting isn’t just about knitting. I knit more because of the process than because of the finished product. I knit to have a predictable outcome of some kind. If I follow the pattern, I know that I’m going to be successful, unlike so many things in life. And I knit to learn something in the process. 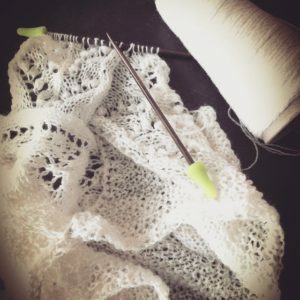 Q: According to Churchmouse Yarns & Teas (my favorite shop on Bainbridge Island), project knitters focus on the destination; process knitters focus on the journey. Which type of knitter are you, and what kind of project fulfills both needs? A: I’m definitely a process knitter. 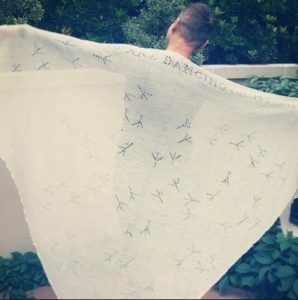 The project I’ve made that fulfilled both needs best is called Near Solstice Shawl with bird footprints on it. 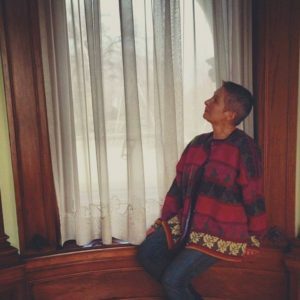 The designer of the shawl is Bridget Rorem. I knit it out of one zillion meters of Jagerspun Zephyr yarn, which is a merino silk blend, thin as a spider’s web. It’s in white and it’s my favorite yarn to knit with. I love to knit in white. There’s haiku across the top that reads, “At winter’s dawning, birds are dancing on the snow to silent music.” It was a project for which I had to keep track of the bird footprints. It’s a lace project and most lace knitting fulfills both needs. I love color but I love to see it on other people. I don’t like to wear it. With a fine project like that, if you knit it in dark yarn, you’ll go blind. Q: Can you give me an example of a challenge or problem in your life that was assuaged by knitting? A: Yes. Lots of them. My mom and I were not close and I came across a pattern for a beautiful Norwegian sweater knit in strange and contemporary colors. It reminded me of my mom. It was a really hard project. It involved a velvet collar and cuffs, and some sewing in addition to knitting. I decided to knit it for my mother. As I was knitting it, I could feel my heart mending. It couldn’t have been for anyone but her. When I finished it, I had fallen in love with her all over again. When I gave it to her, everything in the past melted away and my dream of having a mom I could be close to came true. And it has been ever since. Q: What are your favorite things to knit? A: Anything on tiny, tiny needles. It looks so refined and it looks perfect when it’s done. Read up on how they made the unicorn tapestries. They work from the backside and don’t know what it’ll look like when it’s done. Lace knitting is like that. It looks like a bundled-up fishing net when it’s being knit, and you don’t know what it’ll look like. It’s like a leap of faith because you can’t see it until it’s done. And if you make a mistake, you won’t know until it’s done. Or when you’re blocking it, it’ll fly apart. If you don’t do something just right, it’ll come apart. Q: What knitting project are you proudest of and why? 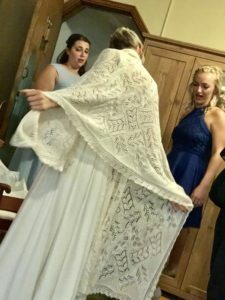 A: My niece’s wedding shawl. I knitted it larger than it shows and I invented a different border. I knit it with the intention that if she has children, it’ll be a baptism shawl. Q: If you met a handsome, 39-year-old man who was an avid knitter, what assumptions might you make about him? A: I would assume he was a deep thinker, valued his time alone, had great attention to detail, and enjoyed making discoveries. I would assume, unless he just knit scarves, that he enjoyed learning new things and was not good at sitting still. Often people will say to knitters that they don’t have the patience. I don’t have the patience not to knit— to just watch a movie without knitting. Q: What is your biggest frustration about knitting? A: That I can’t knit in my sleep. Q: What is the biggest misconception you think people have about knitters? A: That they’re frumpy and that they’re covered in cat hair. Q: What does knitting do for you that you can’t get any other way? A: It’s my meditation. The courage it takes to cut a steek in knitting rivals anything I’ve ever done. A steek is something you use in Fair Isle knitting. It can require 15, 17 or 20 colors. You have to cut your knitting open. Cowards sew it first on a sewing machine. It’s so frightening and you always have to have a glass of wine before and maybe after too, to calm down. Merci mille fois to Catherine for allowing me to interview her and for sharing her passion on this blog. I have not yet acquired the intestinal fortitude to try steeking, even after a glass of wine— or a bottle, for that matter. But I suspect Maxime will be steeking his heart out in some far-flung region of France before long, especially if there’s a murder or two to solve along the way.